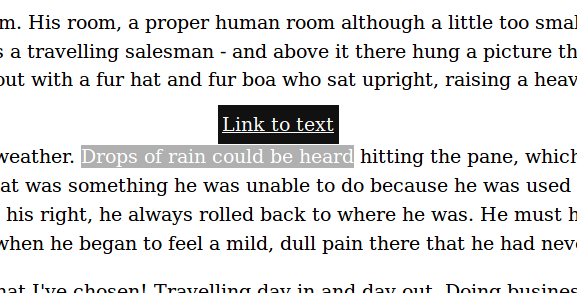 "Link to text" links to the fragmention of the selected text. Clicking "Link to text" highlights the paragraph containing the selected text, and scrolls it to the top of window. Chris Aldrich uses fragmentioner on his site since 2018-01-23 to make highlighting portions of his site simpler for users. Kaushal Modi uses fragmentioner on his site on all pages. From the 2018-05-15 article Has wine gone bad? The Twitter icon links to this long tweet intent URL, and the email icon links to this long email subject and body URL. Both Twitter and email icons darken their backgrounds upon hover. *Except apparently if you triple-click select the headline, there is no UI. Likely a bug. Tantek Çelik instead of "Link to Text", I want "Copy link to text" that copies the fragmention to the clipboard rather than navigates to it. Copying the link seems more like the default desired action more often than navigation, why would you want to navigate to the thing you just selected? See citation: append text to selection copy for ways to copy text to the clipboard using JS. This page was last edited on 27 June 2018, at 16:02.